Join us on Wednesday, September 27, 2017 as we kick off the new BCAMA season in the most social of ways… over a drink of course. And, speaking of which, the first beverage is on us. It’s just part of how we do things at our End Of Summer Shindig. This event is free for BCAMA Members… and just $12 for everyone else. This annual get-together is more than just a farewell to summer, it’s a welcomed opportunity to catch-up & socialize with colleagues AND make new connections with marketers from different sectors within the industry. 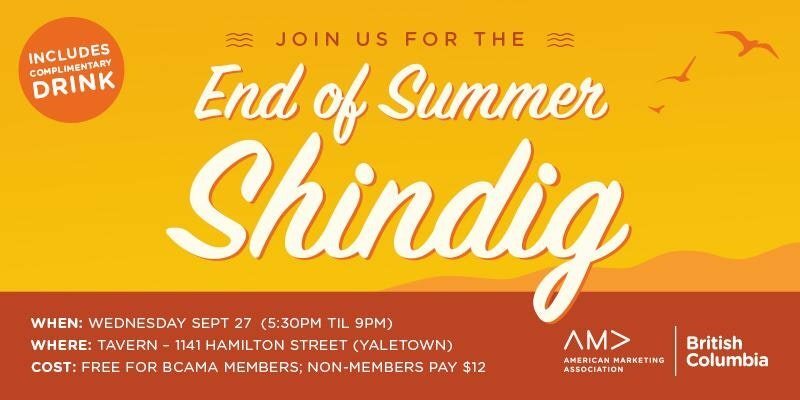 The only problem is that space for this year’s End Of Summer Shindig is limited, so you’ll want to RSVP and/or register as soon as you can. BTW, in the past, those who snoozed, lost. Just a cautionary tale for you last minute types. This event is free for BCAMA Members.